Patricia Pinto comes from a great family of artists and has 25 years experience as a sculptor, muralist & professional painter. She was born in Colombia, South America, and has lived in Florida since 1999. 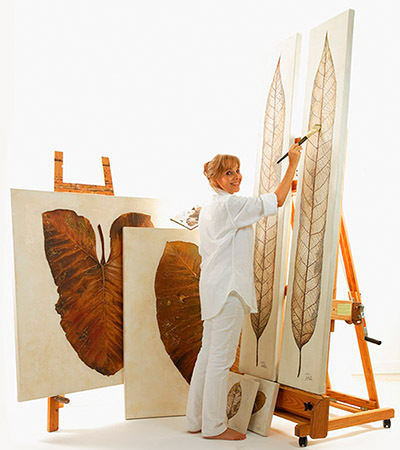 Her paintings are inspired by nature which has always been her passion. Patricia has always tried to paint close to natural environments such as her vacation getaway located on a small tropical island in the middle of the jungle. This island is home to many species of plants, birds and animals. "I love interior design, and I feel very happy by being able to complement today's interior design themes. Painting murals in beautiful and sophisticated houses has given me the chance to capture and understand a client's taste and adopt my paintings to specific necessities of space, color and feelings."